As per the earlier reports of Samsung own entry level Go edition smartphone, the Samsung A2 Core is said to be launched in India. A mumbai based offline telecom seller Mahesh Telecom has said that the smartphone is now available at INR 5290. The Samsung Galaxy A2 Core is said to be the entry-level budget smartphone and has been seen online. The smartphone is a Android Go edition. The model number of the Galaxy A2 Core is the SM-A260 and is similar to the model number of Galaxy A20. the smartphone might be the successor of the Samsung Galaxy J2 Core launched in August 2018. A few days back, the smartphone was spotted on Geekbench platform in which it was listed that the smartphone will house an octa-core processor. 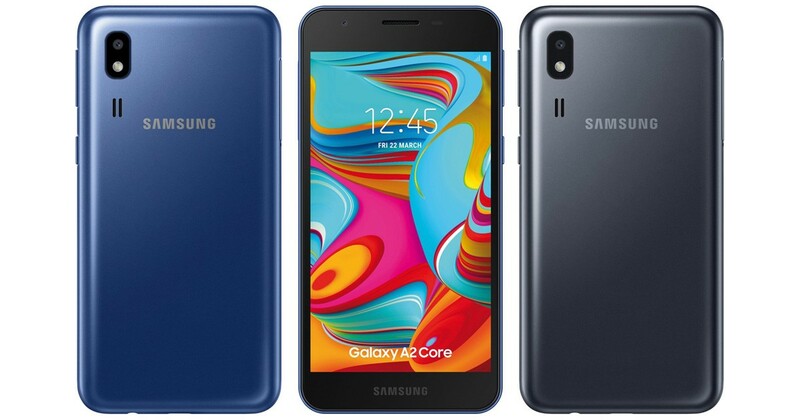 A tweet was shared on the twitter about the Samsung Galaxy A2 Core in which the device is seen in two color options- Blue and Black. We can also see the single camera at the back along with an LED flash and huge front bezels. The phone carries the traditional looks and designs by which we can say that it will be affordable and budget segment due to which it is speculated that it falls under the line up of Go edition smartphone. Aforementioned, the smartphone seen on the Geekbench platform in last month points out towards the processor of the upcoming smartphone will carry. As per the listing, the Galaxy A2 Core under the hood will carry Exynos 7870 SoC, that includes eight Cortex-A53 CPU cores, Mali-T830 MP1 GPU, which is based on the 14nm manufacturing process. It also sports 5-inch qHD (960x540 pixels) screen and has a battery back up of 2,600mAh. The listing also discloses that the device will run on Android 8.1 Oreo and will have 1GB of RAM. We all know that the Galaxy J2 Core which is the former Android Go edition smartphone of Samsung runs on Android 8.1 (Go Edition) and sports a 5-inch qHD with a screen resolution of 540 x 960 pixels. The smartphone under the hood is powered by the quad-core Exynos 7570 SoC and is coupled with 1GB of RAM. in terms of the optics, it carries an 8MP of single rear camera and 5MP of front camera.